After much trial and error, I have re-uploaded the papers and update the links. Some say they can get them, while other say they still won't open. At this point the only other thing I can suggest is to create a folder on your desktop, open the file by double clicking, highlight the papers and drag them to the folder you created. Several people insist this method works. I am sorry for the confusion and issues going on with this download. It has come to my attention that there are issues opening the CCP files. I will work on this tommorrow as I do not know why they won't open as they work for me. I was playing around in PSP last night and this is the result! 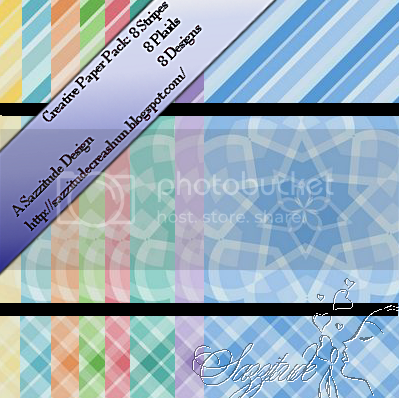 A combo color paper pack. With 3 different designs in 8 color schemes, I'm sure you'll find something to spark your imagination. Note: Since I am on dial-up, I had to break the file down as it just would not upload for me. So to get all pieces you must click and download all 3 links. Thanks for understanding. At the insistence of my nutty buddy Crystal,(pistachio! 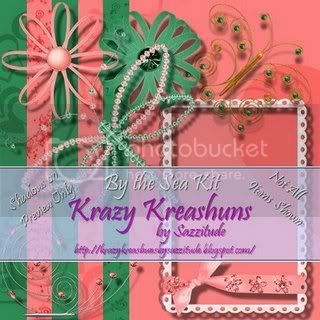 )I have re-uploaded the 1st kit I made. It's called By the Sea. This is a tagger size kit. Please be sure to leave some love either here or on 4shared if you download! Thanks bunches!